2 Bedroom Semi Detached House For Sale in Rotherham for Guide Price £85,000. HAVING CONSERVATORY AND GARAGE. 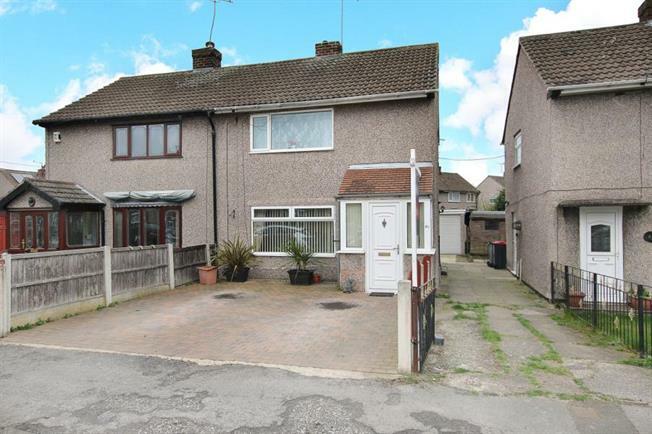 Of interest to a varied purchaser is this two bedroom semi detached property. Situated in this popular location giving access to local amenities and public transport links. The family home has open plan lounge and modern fitted kitchen and downstairs W.C. In brief the property comprises of front entrance porch with door to the lounge. Lounge has open plan spindled stairs to first floor landing and feature fire surround with gas fire. Semi open plan kitchen with breakfast bar. Kitchen has an extensive range of fitted wall and base units and integrated oven, hob and extractor. W.C. having a white two piece suite. French doors to the conservatory. Conservatory having tiled floor and doors to the garden. First floor landing two double bedrooms and family bathroom with white suite including vanity wash hand basin and shower over the bath. Outside off road parking to the front, shared drive to the side leading to single garage and pebbled low maintenance garden to the rear.